homocysteine is an amino acid in the blood but higher levels of it can adversely affect us by various ways. 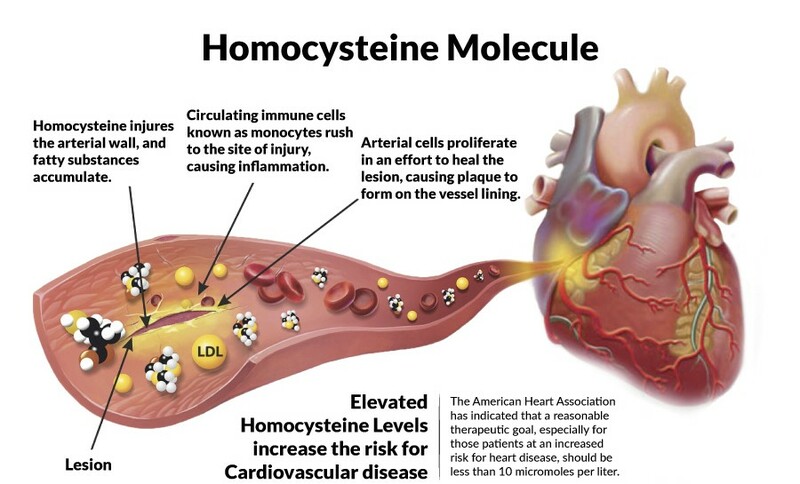 Like Lp(A) Higher levels of homocysteine is directly associated with cardiovascular and cerebrovascular risk. In his masterclass research Dr.Mccully beautifully describes about it. -It is an Amino Acid formed as a result of demethylation of an essential amino acid known as the Methionine. -homocysteine was injected into rabbits, baboons, and other animals. Just as predicted, these experiments show that homocysteine causes plaques to form in arteries and blood clots within veins and arteries. Lower the Levels of vitamin B12 and Folic Acid higher the levels of homocysteine. Vitamin B12 and Folic Acid. Vip B12 acts on homocysteine and it converts it to Methionine for that reaction Folic acid acts as a Cofactor. This is why we require vitamin B12 and Folic acid supplements to combat this issue.